The Roaring Twenties continue to hold a certain allure in pop culture today, with movies like The Great Gatsby providing just one recent example. The era was not only one of glamour and excess, but also one of innovation and modernization, characterized by new inventions, new music, and the “New Woman,” who had greater freedom than ever before. The booming economy provided the average consumer with extra money to spend, and the advent of mass advertising ensured that name brands were in high demand. Razor, the DMA’s iconic 1924 painting by Gerald Murphy, perfectly embodies this period: the matches, pen, and razor would have been easily recognizable and understood as the necessary accoutrement of the modern man. As part of this burgeoning commercial era, newly available food products like boxed cereal and marshmallows became a favorite addition to recipes of the time, which focused on quick yet dainty dishes that could be easily whipped up by the busy working girl. Try out this month’s vintage recipe and and see if you find it just as nifty as the decade itself. Preheat oven to 325° F. Line rimmed baking sheet with parchment paper. In small bowl, stir together brown sugar and white sugar. In the bowl of a stand mixer fitted with whisk attachment, beat egg whites on low until frothy, about 30 seconds. Add salt and vanilla. Continue beating on medium-high, slowly adding sugar, until stiff peaks form. Watch closely to ensure whites are not over-beaten. In separate bowl, mix together chopped walnuts, cereal, marshmallows, and chocolate chips if desired. Gently fold nut mixture into batter with a rubber spatula until evenly incorporated. Batter will be thick and sticky. Drop batter by large spoonfuls onto prepared baking sheet. Bake 11-13 minutes until tops are crinkled and golden, watching closely to ensure cookies do not brown. Allow to cool slightly on baking sheet then transfer to metal rack to cool completely. Recipe adapted from Fashionable Food: Seven Decades of Food Fads. The inspiration for this month’s recipe is a crescent-shaped tobelo, a sacred object from Indonesia used to connect with ancestral spirits. In my family, baking serves as a connector between generations, and at no time is this more true than the holiday season. In that spirit, be sure to bake this crescent-shaped cookie with your family and let everyone explore their artistic side with the decorations! Cookies: Place almonds in food processor and process into a fine crumb. In a medium bowl, stir together processed almonds with flour. In the bowl of a stand mixer fitted with paddle attachment, cream butter, sugar, and vanilla, beating at medium speed until light and fluffy, about 2-3 minutes. Add flour mixture to mixer in three batches, mixing on low speed until just combined. To form cookies, scoop off about a tablespoon of dough then roll between hands to shape into a log about 3 inches long. Place on baking sheet, then pull ends down and pinch to form a crescent shape, leaving about 1 inch between each cookie. When sheet is full, gently press down each cookie to flatten slightly. Bake until golden on bottom, about 13-15 minutes. Allow to cool slightly on baking sheet then transfer to metal rack to cool completely. Topping: Whisk dark chocolate in a glass bowl set over a small pot of simmering water until mostly melted, then remove from heat and whisk until smooth. 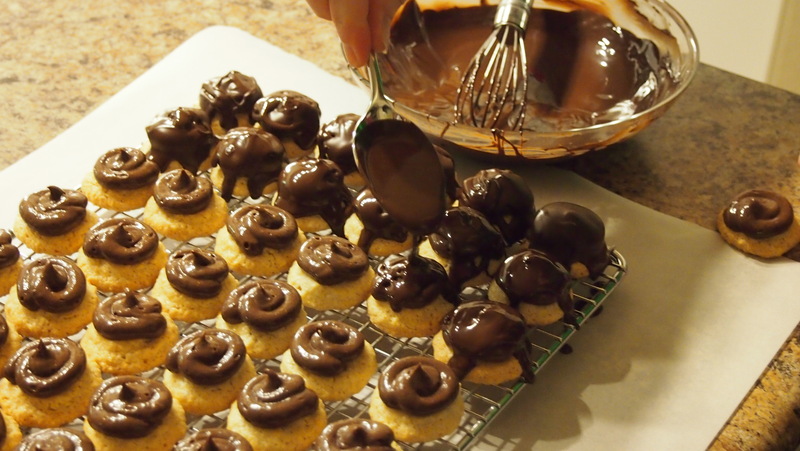 Once cookies have cooled, dip one end of each into chocolate then sprinkle with desired decoration. Place on wax paper to dry. Repeat process with white chocolate. Recipe adapted from Very Merry Cookie Party. For this month’s recipe, we’re taking a trip through Paris with our new exhibition, Posters of Paris: Toulouse-Lautrec and His Contemporaries. Alphonse Mucha created this poster for Sarah Bernhardt, one of the most renowned actresses of the 19th century. 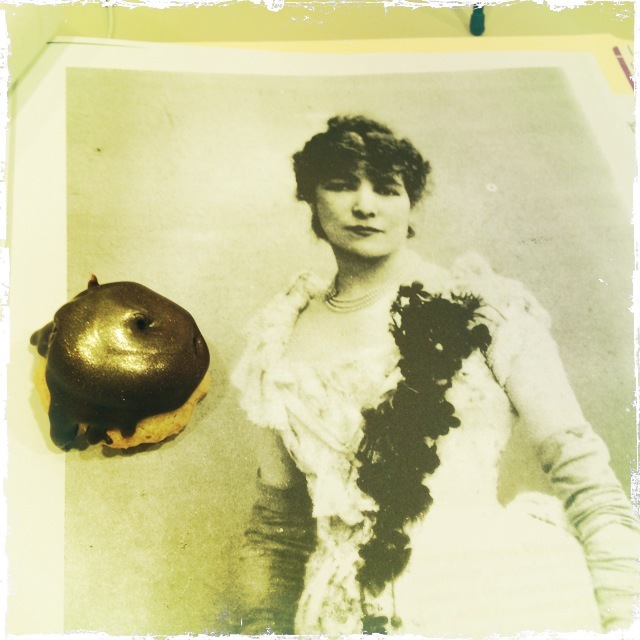 She was so loved, in fact, that a Scandinavian baker named a cookie for her. Though somewhat complex, these multilayered confections are sure to dazzle, much like their namesake and her posters. Filling: Whisk chocolate in a glass bowl set over a small pot of simmering water until smooth and melted. Remove chocolate from heat and set aside to cool. Combine sugar and water in small saucepan and simmer until syrup becomes clear, about 5 minutes, then set aside. In the bowl of a stand mixer set over a small pot of simmering water, whisk egg yolks until warm, about 2 minutes. Transfer bowl to stand mixer fitted with whisk attachment. Add cream and beat mixture on medium until combined. Reduce speed and slowly pour in hot syrup. Return speed to medium and continue beating until cool and fluffy, about 3 minutes. Add melted chocolate, scraping down sides of bowl as needed until fully incorporated. Refrigerate filling until firm, about 1 hour (or up to 1 week). 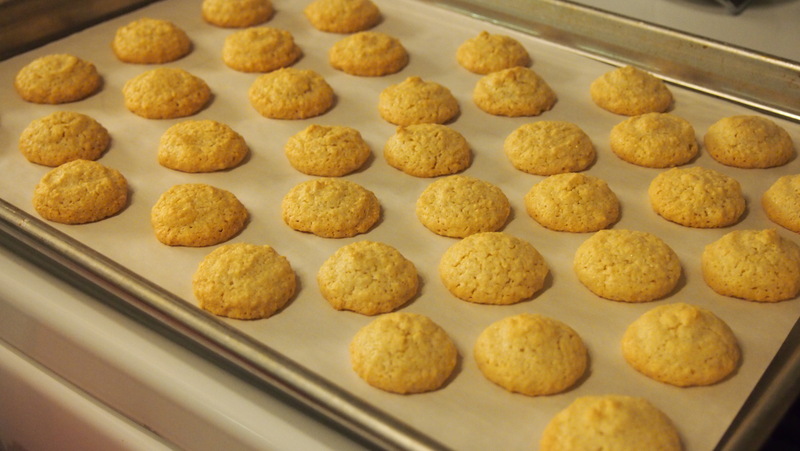 Cookies: Preheat oven to 325° F. Line rimmed baking sheet with parchment paper. Place almonds in food processor and process for 1 minute. Add sugar and process into a fine crumb, about 3 minutes. Add egg whites and almond extract and process until mixture wads around blade. Scrape bowl with spatula and add splash of water. Process a few more seconds until paste is firm yet smooth enough to pipe. Transfer paste to pastry bag fitted with coupler only (no tip). Pipe small rounds onto prepared baking sheet, applying pressure to bag for about 4 seconds per cookie and leaving 1 inch between each. Bake until golden around the edges, about 20 minutes, rotating sheet halfway through. Allow to cool slightly on baking sheet then transfer to metal rack to cool completely. Once cookies are completely cool, transfer filling to pastry bag fitted with coupler only or with #11 tip. Pipe a peaked mound of filling on top of each cookie. Transfer cookies to freezer until filling is very firm, about 1 hour. Coating: Whisk chocolate in a glass bowl set over a small pot of simmering water until smooth and melted. Remove from heat and stir in shortening. Cool until barely warm. Remove cookies from freezer and place on cooling rack. 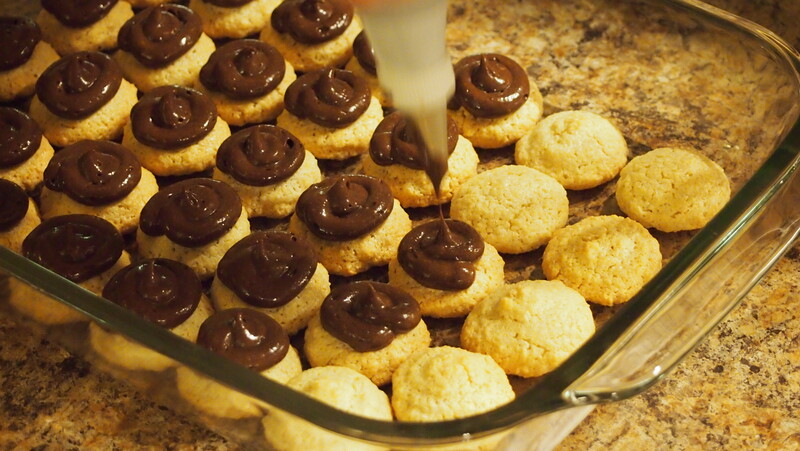 Working quickly so filling doesn’t melt, spoon melted chocolate over cookies until filling is completely covered. Refrigerate finished cookies and serve chilled. Sarah with a finished Sarah, dusted in gold like her beautiful posters. Almond macaroon recipe adapted from Baking Illustrated and used with Sarah Bernhardt cookie recipe, adapted from Martha Stewart’s Cookies.